To further the advantage of using Ethernet for broadband connectivity, HC-LM01 Long Range Ethernet product extends the maximum driving distance of Ethernet to 800m for 10Base-T and 250m for 100Base-Tx without using any repeaters. 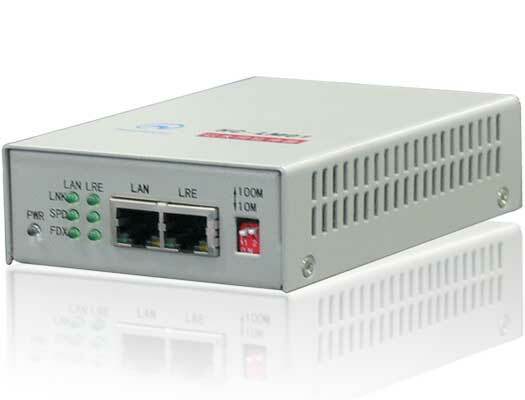 The HC-LM01 supports full-duplex standard and long range Ethernet at 10 and 100 Mbps operations. It can be widely used as Customer Premise Equipment (CPE) for broadband Ethernet installations and industrial network. IEEE 802.3, IEEE 802.3U compliant. Conversion between standard Ethernet to Long Range Ethernet. Long range extension up to 800m for 10Mbps and 250m for 100Mbps over Cat5 cable.